There are a range of features to consider. When deciding on the one that is right for you. It can come down to the reasons for buying. And your goals and purpose. Fortunately, recumbent exercise bikes can be versatile. A number of them catering for a number of wants and needs. Which can mean you need only one even if you have multiple people wanting to work on their fitness. With this guide rather than list and explain features, I’ve looked at what features you may want and the choices you can make. 2 How Much Do You Want To Spend? 4 Do You Want Even More Workout Variations? 5 What accessories do you want with your bike? 6 How Hard Do You Want The Resistance? 7 Do You Want A Different Backrest Angle? 8 Do You Want Additional Lower Back Support? 10 Do You Want Arm Rests To Help With Support/Comfort While Seating? 11 How Tall Or Short Are You? 14 Do You Want To Step Through The Bike So You Don’t Lift Your Foot? 15 Do You Want Help In Keeping Your Feet On The Pedals? 16 How Much Room Do You Have For Your Bike For Use And Storage? 17 Do You Need To Adjust Seat For Different Heights Regularly? 18 Do You Want Arm Workouts? Recumbent exercise bikes have a few common features. These are the basics to expect – they are quiet, have magnetic resistance, can be adjusted to fit a range of different heights, a large seat with a backrest and at least a basic console. For the most part they can be used by adults of all ages (subject to height)to get a good low impact cardio workout and many people find them a good way to recover from injury or rehabbing after surgery as well as using the bikes to get into shape or to help with burning calories. There are differences in the quality and range of these features which tends to be dependent on the price you want to pay for your bike. Rather than go through all the various options that are available and then say that you can’t have that unless you spend X I thought I’d start at the price points. In other words what you want to spend does limit the features you can expect. Fortunately it is possible to get a good solid light to moderately hard in regards to resistance by spending up to $200. 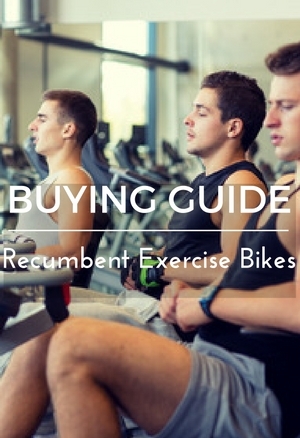 My list of the best under $200 recumbent bikes can be found here. When you move up in price range you get better features and easier to use bike – in particular the adjustment of the seat is easier – although you still need to be off the bike to make the adjustment. You can also get pre-set programs and workout tracking. The best recumbent exercise bikes under $500. Over that price you get much more features, seats you can adjust on the bike, Fitness apps, adjustable backrests and better back support. If you are not too interested in pre-set programs and want to just pedal away and adjust resistance as you go you have a number of choices. You don’t have to pay over $200 to get that either provided you don’t want high levels of resistance and want just moderate levels of resistance. Pre-set programs have profile programs that alter the level of resistance you are pushing against at certain intervals. This is done automatically (There is one that is more on how fast you pedal and you change the resistance manually). They also have heart rate control programs where they’ll alter the resistance to keep your heart rate in a selected heat rate zone. Finally they have fitness tests and heart recovery tests. So there is plenty of variety there you can get ones that give you 6 programs if you only want a little variety up to 29 or more. You can get variations of these when you spend over $200 and there are good choices under $500 that cover all those. Do You Want Even More Workout Variations? There are bikes that using bluetooth work with Fitness Apps that you can download to your mobile device and give you even more options for exercising at outdoor locations with video streaming on the device. What accessories do you want with your bike? These might be a little secondary but these can help with convenience and can help to think about this before you buy. You’re options are water bottle holders, fans, speakers, media shelf and personal electronics charger. (See Schwinn 270 for all these). How Hard Do You Want The Resistance? if you are looking at harder levels of resistance to workout you do need to be prepared to pay over $200 but you can get bikes with hard hill climb type resistance for below $500. These bikes also allow you to have very light resistance to moderate and in between, so that they can cater for all abilities and wants. They can make a good choice for those wanting to start at a low level and move on up to very tough workouts. However, if you just want light and/or up to moderate levels of resistance then along as you are okay with a basic bike you can get these for under $200. They do provide a reasonably smooth pedaling motion and you can get your heart rate up and get a sweat on you just don’t get the top levels of resistance that very fit individuals may want to push themselves. Do You Want A Different Backrest Angle? Most bikes have cushioned and/or contoured backrests that are at a fixed slight angle like you get on a seat. These can provide good support as well as being at a comfortable angle for most. Some who want a different angle try to get this with cushions which can improve the angle a little. If you want or need a position that is more reclining there are some bikes that allow you to adjust the back to various positions to provide the best angle for your back. The Ironman X-Class 410 Recumbent Bike has 3 positions. The position does need to be made off the bike. The three positions are a slight angle as on a chair, almost in full recline position and halfway in between which can cover most people’s requirements. It does come at a cost of over $500 but below $1000 to get this type of adjustment. Do You Want Additional Lower Back Support? Most bikes provide an angled back rest which are at an angle that does give you good support for the back but its not always enough. People that do struggle to get the support they need often resort to using a rolled up towel or a small cushion. There are bikes like the Ironman X-Class 410 Recumbent bike that do come with a support built in to the back to provide this support which is more stable and won’t move around like you do get when using a cushion or towel. Most bikes are designed with you sitting down on the seat from the front of the bike (they have a step through design – see below). This is going to be fine for most people. Or you may want to be able to slide in and out of the seat sideways. T o be able to do this you need to be looking at bikes that have their rear handlebars or hand rails at the level of the bike. Some are at a level a few inches above the seat which can make it difficult to get in and out from the side. For many of the bikes you can decide not install these handlebars if you like the rest of the bikes features but it does cut down on support that you may want from time to time. There are bikes that do have a swivel seat that moves that swings to the side but these do seem to be specialist and be very much a premium price. Do You Want Arm Rests To Help With Support/Comfort While Seating? The handlebars at the side of the seat tend to be bars with many at the height of the seat but with others a few inches above the seat height. But even those at above the height of the seat don’t really allow you to rest on them as they don’t have much in the way of padding. There are some bikes that do have padding on the arms and they can help with comfort and support and help to take some strain off the back as you cycle. The model that I suggest here has fixed arm rests so you can’t slide into the seat from the side. If you are between the heights of 5ft 2 ins and 6 ft you are going to have the widest choice of bikes as they accommodate this range. Outside of this range it can get a little more difficult and in some respects the product listings don’t help with this – many suppliers don’t include this important information. If you are over 6 ft ins then the following are a good fit. If you are below 5 ft 2 ins you might want to take a look at the following bikes. Most bikes do come with some form of heart rate monitoring there are exceptions and they do tend to be at the lower end of the price range. The most common form is the use of hand pulse sensors. I’m not really a big fan of these because they can be hard to get a good reliable reading from – with many not being able to get them to work properly. You may be ok and if so they can help you monitor your heart rate for training in your heart rate zone and doing heart recovery tests. I prefer the use of the heart rate strap and this isn’t that common with only a few bikes offering this under $1000. The two bikes that get good ratings overall are the Schwinn 270 and Nautilus R616 (very similar bikes) give you this option. You do need to buy an non-coded polar heart rate strap to be able to monitor your heart rate but it is more reliable and really help with your fitness. They both do allow you to upload the information to a Fitness account and myfitnesspal.com. Do You Want To Step Through The Bike So You Don’t Lift Your Foot? Fortunately most bikes come with this type of design. This is where you can step across the frame by lifting your foot only an inch or so to get into position to sit on the seat. You may want this if you problems lifting your foot to make it easier to get on the bike. There are only a few that designed for home use don’t have this but it is worth looking at the bike and also checking the description to be sure. This is the case in all price ranges too. Do You Want Help In Keeping Your Feet On The Pedals? Most bikes do come with straps that you can be used to help your feet on the pedals all the way through the stroke. They do tend to be plastic straps with holes that fit on a tab rather than using a buckle so can be a little hard to adjust at first. But it’s not all bikes that have this – it is the majority, so it is worth checking that before you buy if you need this or you prefer using a bike with them. It is the exception that don’t have them. How Much Room Do You Have For Your Bike For Use And Storage? Most recumbent bikes have foot print of around 60 ins by 24 ins. They’re not the most compact exercise bike with upright bikes or folding bikes requiring less but you don’t get the same support and cycling position. If you do have an issue with space for when the bike is not in use and want to be able to store the bike out of the way in a closet or behind a door then you might want to look at folding exercise bikes. Do You Need To Adjust Seat For Different Heights Regularly? There are 3 different ways that you can make the adjustment for seats – moving the back of the bike, moving the seat while off the bike and moving the seat while sat in it. I do talk about these methods here. If there is a few of you in a household that are going to use the bike regularly and you are different heights you will be having to adjust the seat backwards and forwards frequently . The more expensive bikes let you make the changes while in your seat (See Ironman X-Class 410 Recumbent Bike) , the ones under $500 have a simple method of using a lever to do this which is quick and easy but you need to be off the bike. Under $200 you have the choice of just moving the seat or the back of the bike to get the right fit with the use of pull pins and knobs to secure into place. The easier method is the seat it is a lot lighter making it easier to get it into position. Do You Want Arm Workouts? If you want to use the bike to exercise your upper body your choice of bikes is limited. Most don’t have moving arms or foot pedals. In those cases you need to find your own way to get that exercise perhaps using dumbbells etc. However there are a couple of reasonably priced options to choose from,. They have hand pedals or moving arms on the front support that you can use as you use the foot pedals or on their own. You can see the 2 recumbent exercise bike with moving arms here. The important thing with recumbent exercise bikes is that you get the support and comfort you want on the seat and get a good smooth pedaling motion that doesn’t impact on your joints. It is also important that you can get the bike to fit you properly to reduce the possibility of pain in the legs as you can get when you don’t get the proper range of motion in the knee. There is a wide price range for the bikes – and even the most affordable give you the options to adjust the bike to fit all sizes and give a reasonably smooth riding motion. Obviously the lower priced bikes don’t give the same quality of ride (in most cases) nor are they made as sturdily. They also don’t provide the hardest levels of resistance providing more for the low to moderate levels of resistance intensity. They also don’t have the pre-set programs you get with bikes over $200 and on. But it is possible to find a bike for all capabilities, budgets and the majority of heights to get a comfortable low impact workout in the comfort of your home. I never realized how many things there are to consider before buying. Your article is a very helpful checklist. Thanks. Its great to hear that it was hrlpful. My sister loves to exercise on a recumbent bike.